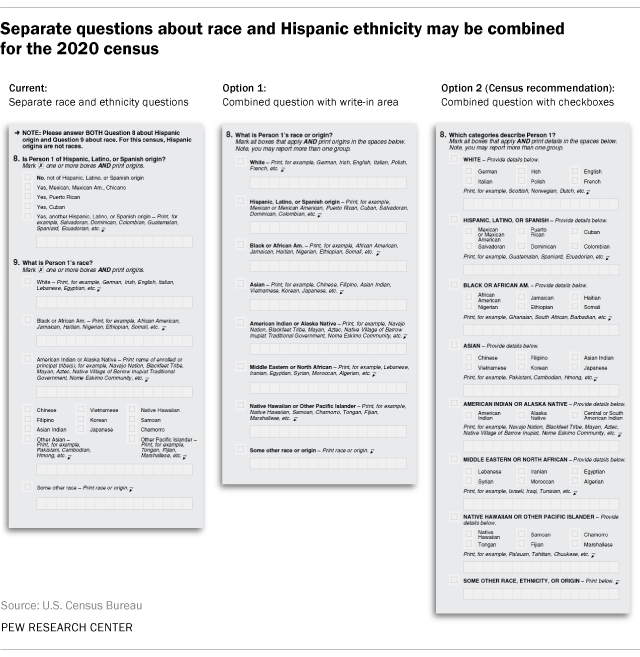 Federal officials are considering major changes in how they ask Americans about their race and ethnicity, with the goal of producing more accurate and reliable data in the 2020 census and beyond. Recently released Census Bureau research underscores an important reason why: Many Hispanics, who are the nation’s largest minority group, do not identify with the current racial categories. Census officials say this is a problem because in order to obtain good data, they need to make sure people can match themselves to the choices they are offered. Census data on race and Hispanic origin are used to redraw congressional district boundaries and enforce voting and other civil rights laws, as well as in a wide variety of research, including Pew Research Center studies. After years of trying to persuade Hispanics to choose a standard race category, the Census Bureau has been testing a new approach, with what the agency says are promising results. 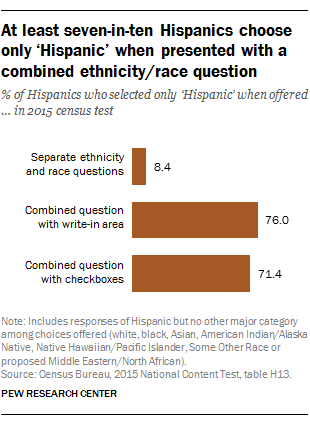 In 2015, the bureau contacted 1.2 million U.S. households for a test census that experimented with two different ways of combining the Hispanic and race questions into one question (and included a proposed new “Middle Eastern or North African” category as well). Respondents could self-identify in as many categories as they wanted, or only one. Based on the test results, Census Bureau researchers have recommended using a combined question about race and ethnicity. Among their reasons was that respondents supplied equally good detail on their national origins (for example, “Mexican” or “Cuban”) as they did in separate questions, but only a small fraction checked the “some other race” category. The “some other race” option is not an official federal race category and was intended to be a residual option for a small number of respondents in census surveys. Instead, it has grown to become the third-largest race group counted by the Census Bureau in the past two censuses. This group is mainly Hispanic: In the 2010 census, 97% of those who checked “some other race” and no other race were Hispanic. Other evidence in favor of a combined question is that the new Census Bureau research also found that people were less likely to give no answer or an invalid answer when responding to the combined question than to the separate questions. If people do not give valid answers, the bureau fills in their responses using statistical imputation, based on characteristics of their neighbors. Another finding that favors a combined question is that when a sample of 2015 test census respondents were interviewed after they had submitted their questionnaires, they were more likely to give the same answer for their race and Hispanic origin if they had been asked a combined question about race and Hispanic origin than if they had been asked separate questions. That is considered a good finding because researchers value consistency. Approval of a combined race and Hispanic origin question would be part of the first major revision in two decades of federal policy governing the collection and publication of race and ethnicity statistics, a revision that also might include adding the Middle East/North Africa category. The final decision on this federal policy rests with the Office of Management and Budget. The budget office, advised by an interagency task force, is now collecting comments from the public – including researchers and advocacy groups – and hopes to make a decision by December. Any change would be instituted in the 2020 census, and the bureau must send its question wording to Congress by April 1, 2018. However, the budget agency could allow other federal offices additional time to implement new rules. A proposed combined question does face obstacles. Some advocacy groups and researchers are concerned that new data would not be fully comparable with data collected up to now, even though the federal government would supply “bridging” guidance. In addition, the interagency group advising the budget office raised the question of whether the cost and effort of making a change could be justified for agencies other than the Census Bureau (most of which don’t use the “some other race” category). The census has included racial categories since the first one in 1790, but categories have changed over the decades. A separate question about Hispanic origin has been included for all households since 1980. Since the 1970s, all race and Hispanic questions rely on people to identify themselves.